Win A Social Media Library! Steve over at Polar Limited is doing a networked social media book giveaway. Steve has convinced these seven authors Mitch Joel, Tamar Weinberg, Chris Brogan + Julien Smith, Gary Vaynerchuk, Avinash Kaushik, John Jantsch, Beth Kanter and me to offer up free copies of their books. You can win a this set of books, signed and personalized by the authors that will teach you how to be human through your computer, generate tons of social capital, and be a social media virtuoso - plus have some great books to curl up with during the holidays. 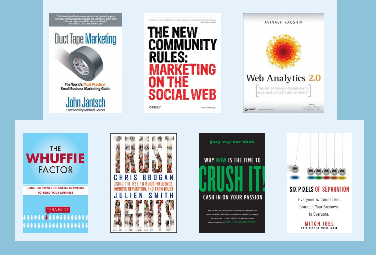 Leave a comment below telling me your social media plans for 2010, and why you think these 7 books will help you achieve what you want to accomplish. Best comment in within the next week wins the set. www.kaushik.net/avinash: this is the amazing blog of Web 2.0 Analytics author Avinash Kaushik. He’s simply the smartest guy in the world when it comes to analytics and what it means for your business. www.ducttapemarketing.com/blog: this is the blog of John Jantsch, THE expert on small business marketing. He’s also writes probably the most practical, hands-on marketing blog on the planet. It’s a must-read.